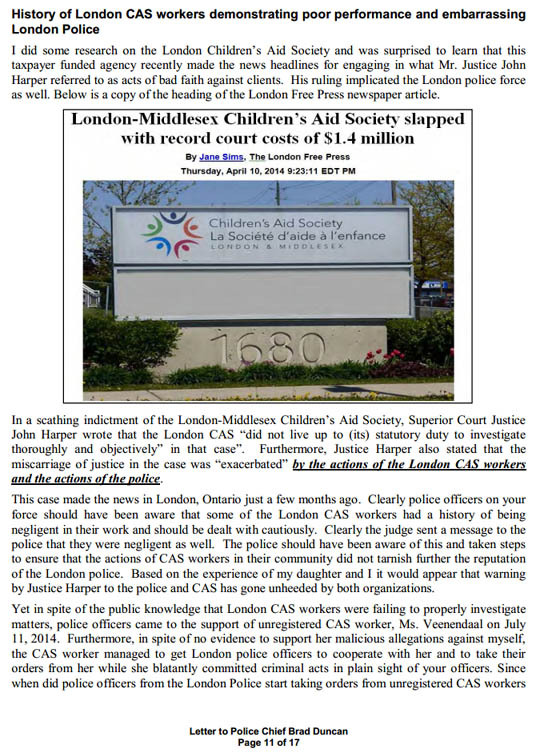 Justice Minded readers are encouraged to help promote by reading the attached letter written by a mother to the Chief of police for the London, Ontario Police Services which is attached to this campaign and by participating in a mail campaign to put public pressure on the Chief of Police lay criminal charges against the CAS worker who was involved in the matter. Readers can support the cause of justice by participating in this campaign and by sharing the letter with friends and business associates. 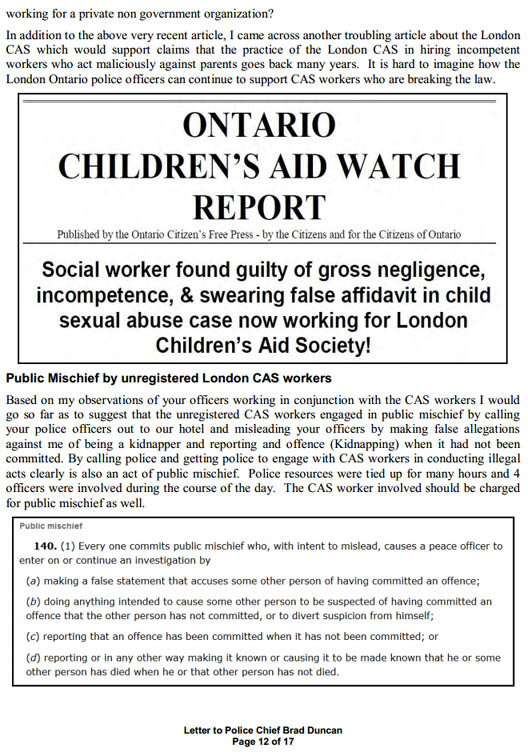 As a justice minded Canadian and mother of one child daughter who is almost 12 years of age, I am writing this letter to request that criminal charges be laid against a worker with the London Children’s Aid Society, specifically an unregistered social worker by the name of Ms. Coby Veenendaal. To support my request, I have outlined in the body of this letter the circumstances and events which would reasonably support that charges be laid. Participation in the campaign is easy. 1) Create a free Advocacy Canada account. Login. 2) Read the template letter. 3) (optional) If you would like to make any personal modifications to the letter to suite your own style of writing or to ad some of your own thoughts on the subject of the letter then do so. I verily believe that your officers knew or ought to have known that what the unregistered London CAS workers were doing to us was illegal. 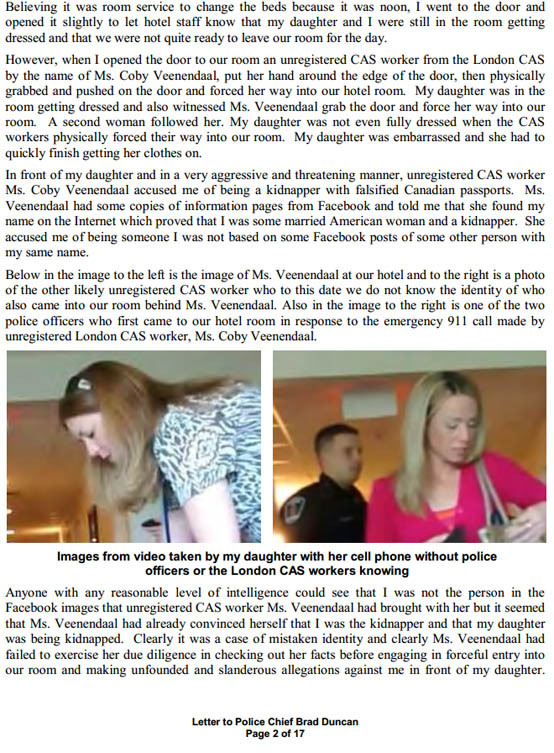 Your officers arrived at our hotel and ended up acting not much more than goons and accomplices to the two London CAS workers to commit criminal acts against my daughter and I. For over 10 hours we were detained and denied food. Clearly under Section 1 of the Police Services Act your officers are obligated to protect the rights and freedoms of citizens. There is nothing in the Police Services Act which requires officers to follow orders given to them from CAS workers employed by a private, non government CAS agency. What the London police officers should have done when they first arrived was to simply have asked what authority the CAS workers were exercising to detain us in our hotel. If the CAS workers could not provide officers with that information, then the police officers should have protected our rights and freedoms by telling the CAS workers to leave peacefully and to take matters to court. But this is not what the first officers on the scene did. We were detained for over 10 hours! While the first two officer on the scene did not do much except to support the CAS workers break the law, matters only became worse when two different police officers showed up to carry on from where the first two officers had left off. The two officers who arrived to replace the first two officers were much more aggressive and did more than just tell us to cooperate with the unregistered CAS. One of the two officers who showed up for the second shift directly threatened and intimidated us and violated our rights in addition to the threats and intimidation by the CAS workers themselves.